Does the idea of cleaning every inch of your home give you happy thoughts? 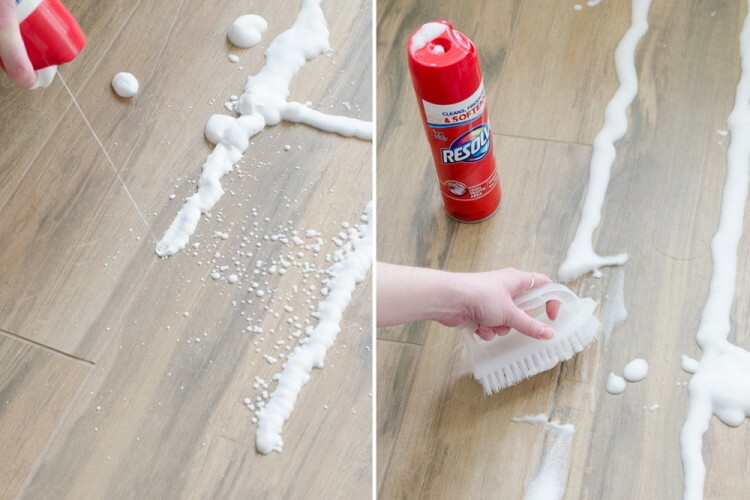 If so, you’re going to love these extreme cleaning tips that will help you get the job done right in smart and effective new ways. 1. 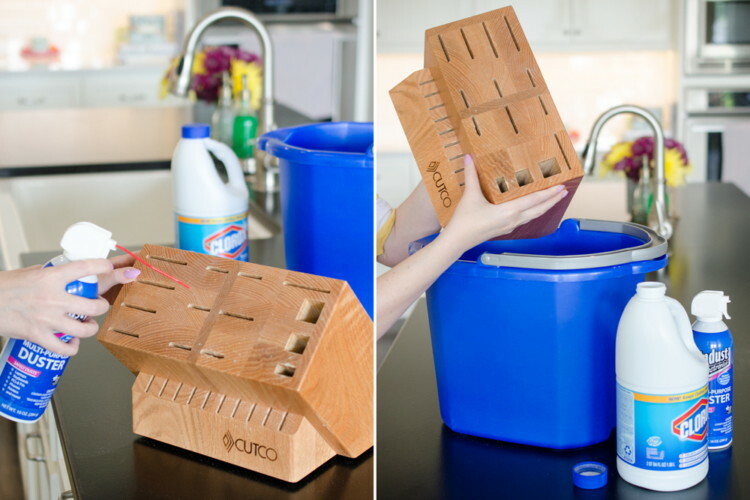 Clean and sanitize a knife block with a mild bleach solution. To clean: Turn the knife block over and shake it to remove any crumbs — or, use compressed air to remove debris. Then, wash the block in warm, soapy water. To sanitize: Add a tablespoon of bleach to a gallon of water and immerse the block for about 1 minute. Rinse the block with warm water then turn it upside down to dry. 2. Clean your refrigerator’s water and ice dispenser with a vinegar-water solution. 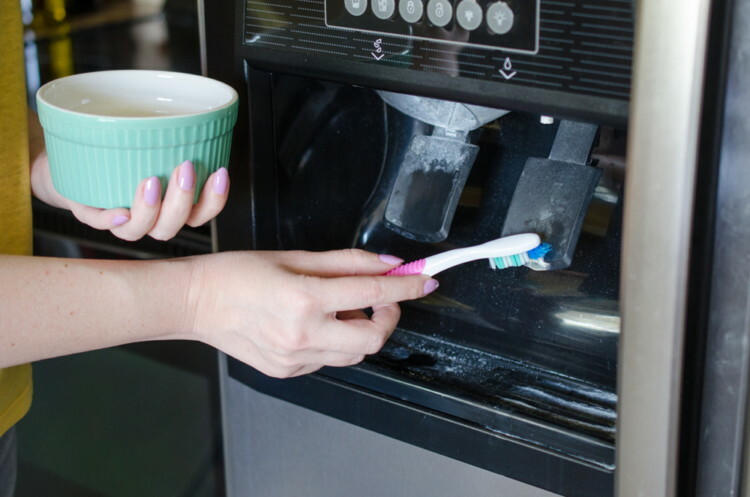 Create a 50/50 solution of vinegar and water, and use an old toothbrush to get into the crevices of your fridge’s water dispenser. Clean monthly! 3. 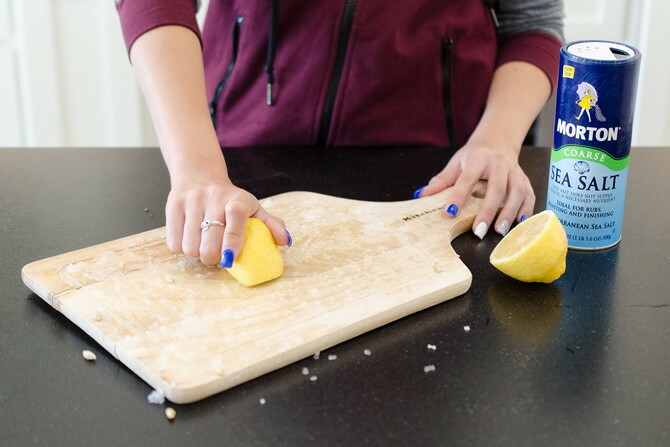 Sanitize and deodorize wood cutting boards with lemon and salt. Cut a lemon in half and squeeze its juice over your wood cutting board. Use the squeezed lemon to spread the juice around, then sprinkle coarse salt over the board and use the other lemon half to scrub in the salt. Use a paper towel (slightly damp if needed) to wipe off the salt and lemon juice. 4. 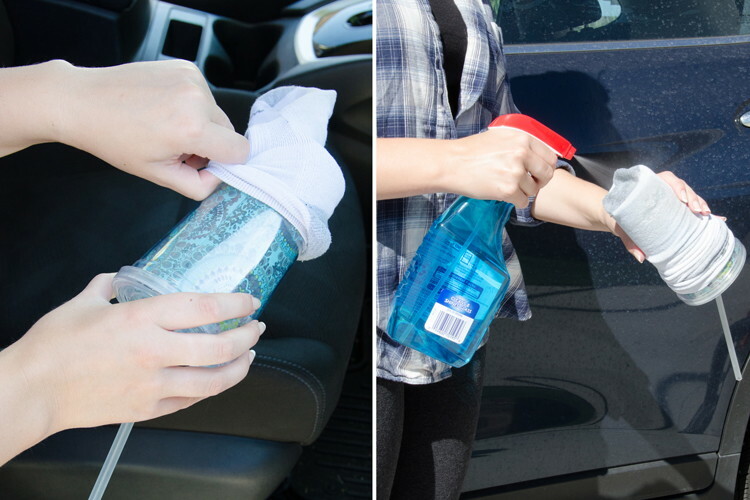 Use an old sock, Windex, and a travel cup to clean cup holders in your car. 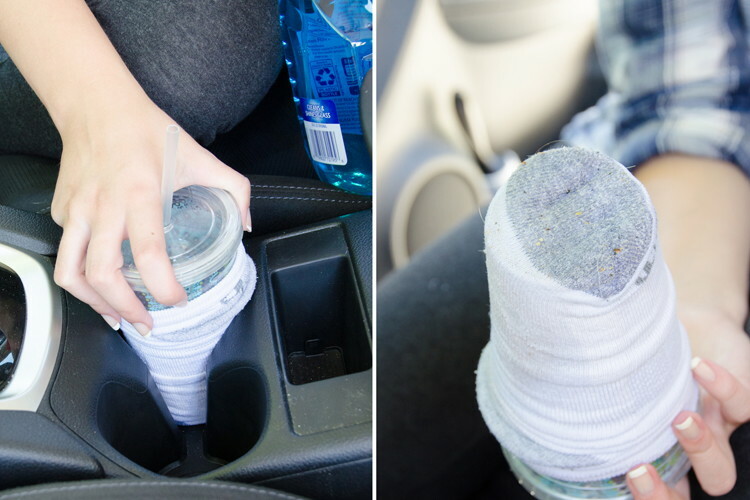 Put an old sock over the bottom of a travel cup, spray with Windex, and twist to remove dirt and grime in cup holders. 5. 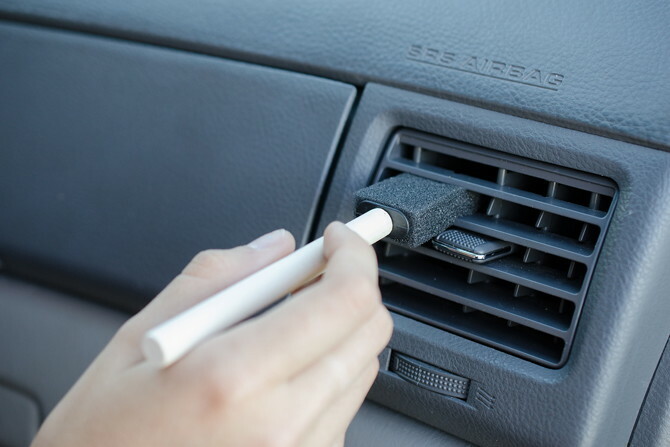 Dust auto A/C vents with a foam craft brush. 6. 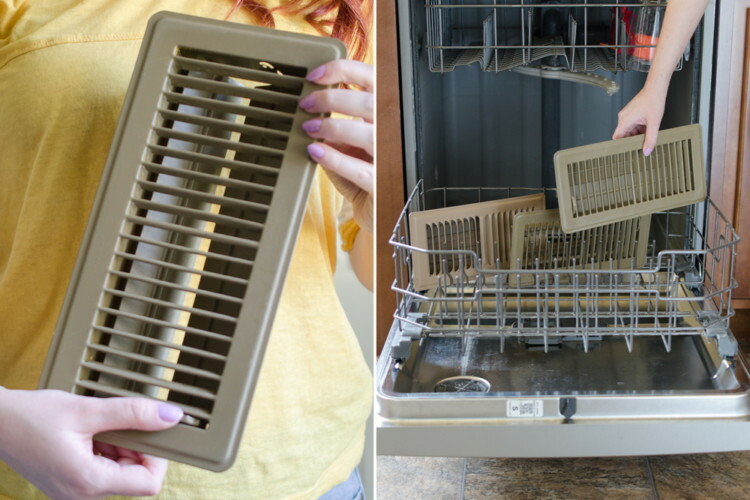 Rinse your air conditioning vent covers in the dishwasher. Close the vents before washing so there’s more surface area that gets cleaned. Then, blow dry any remaining water from the covers on the cool setting before installing covers back over your vents. 7. Throw your pillows in the washing machine. 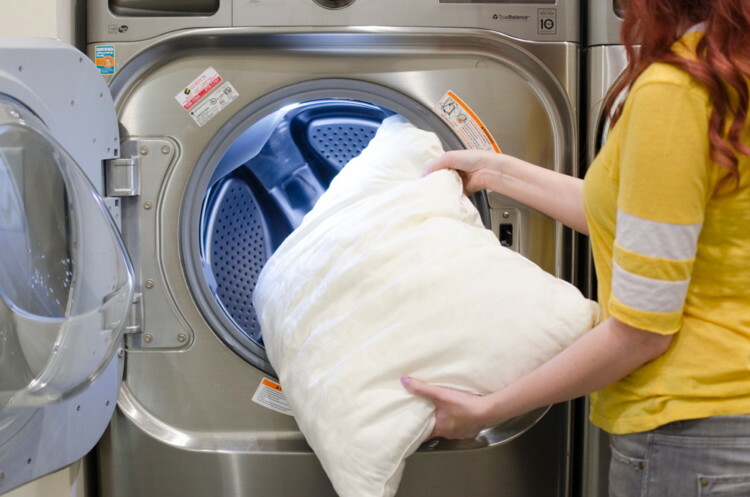 Toss a tennis ball in the dryer with your washed pillows to help fluff them back up. 8. 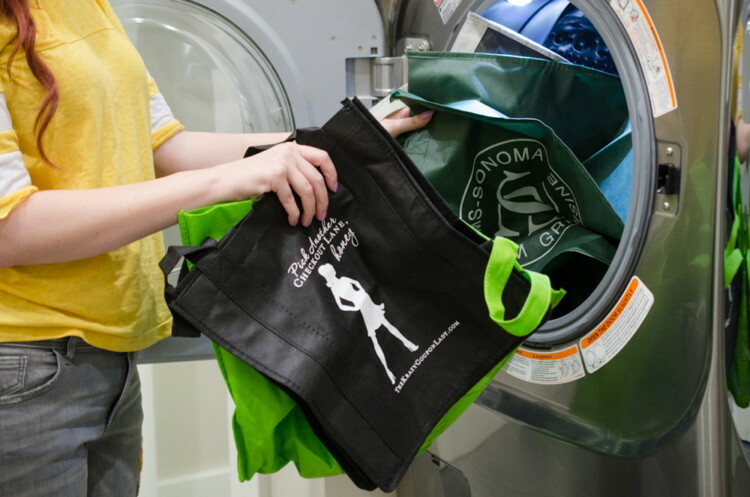 Clean reusable grocery bags in the washing machine regularly. 9. 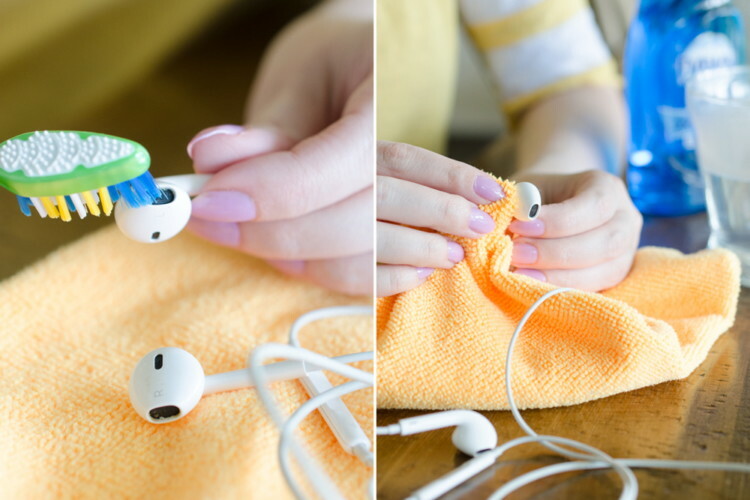 Remove dirt and dust from the metal parts of your earbuds with a dry toothbrush. Then use a gentle cleaner (like dish soap and warm water) and a soft cloth to clean the outside. 10. 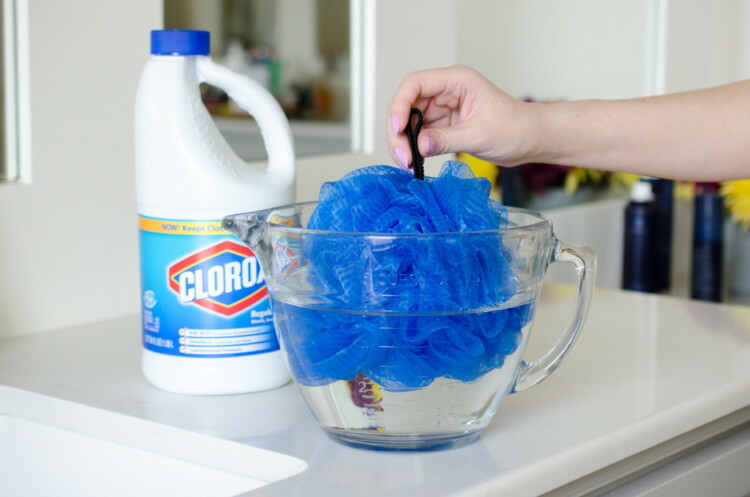 Soak your loofah in diluted bleach for 5 minutes every week. Or, just throw it in the washing machine. 11. Vacuum your broom often. 12. 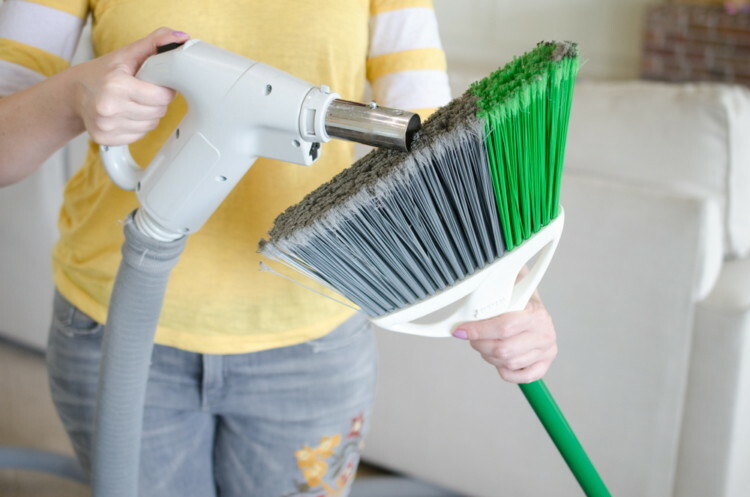 For a deeper clean, soak your broom in a bucket of warm water and dish soap. 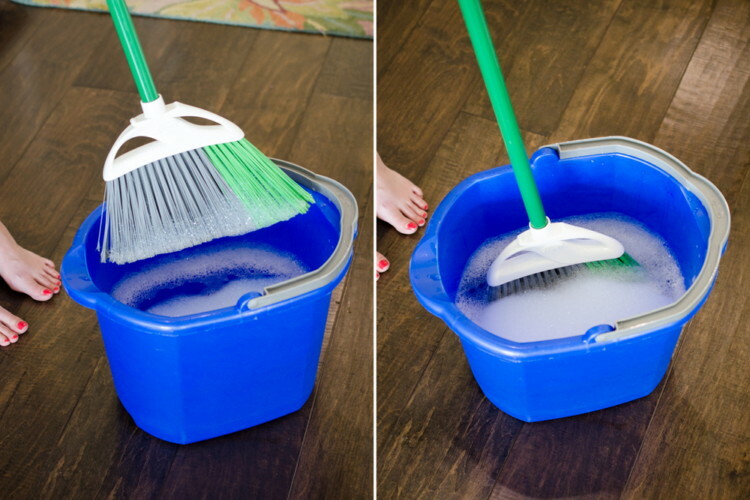 Add a few drops of dish soap in a bucket of warm water, and soak your broom for an hour. Rinse and let it dry completely before storing it away. And don’t forget the dustpan! Spray it with disinfectant, or use a bleach wipe. 13. 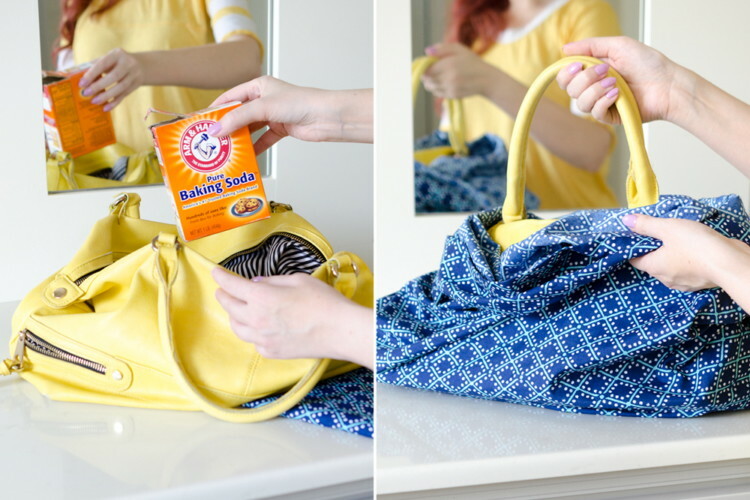 Get rid of lingering smells inside your purse with baking soda. Carefully place an open box of baking soda inside your purse, then pull your purse’s dustcover (or use a pillowcase) over your bag. The baking soda should remove any odors. 14. Clean light switches and plates with rubbing alcohol. Spray a cleaning cloth with regular household cleaner or rubbing alcohol, and wipe the surface of your light switches (don’t apply cleaning solution directly on the switch!). Get into the crevices with a Q-tip. 15. Dust lightbulbs with a cloth moistened with rubbing alcohol. 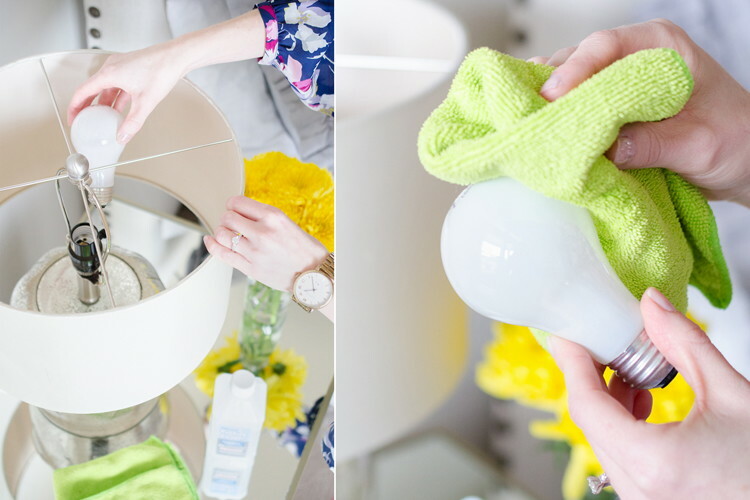 By removing the layer of gray dust covering lightbulbs, more light will shine through and make rooms brighter. Less lightbulbs needed to brighten a room = less electricity = money saved. 16. 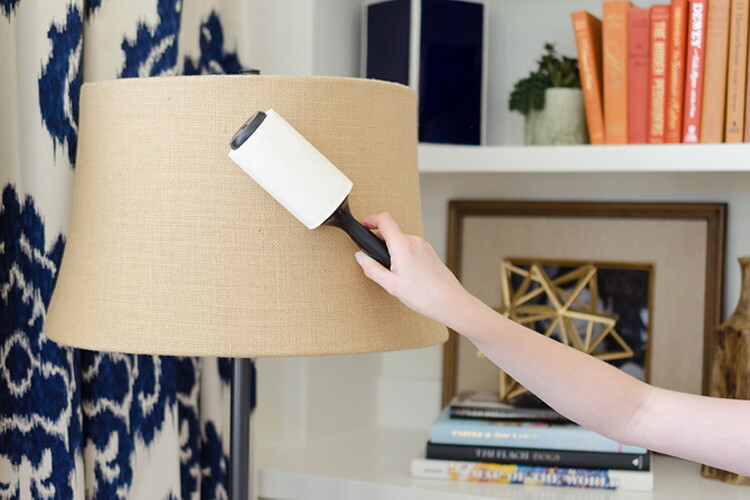 Use a lint remover to dust lampshades. 17. Use Resolve carpet cleaner to clean the grout between tiles. Spray some Resolve carpet cleaner into the grout lines, scrub with a brush, and let it sit for about 10 minutes before wiping off. Then, just mop floors as usual. 18. 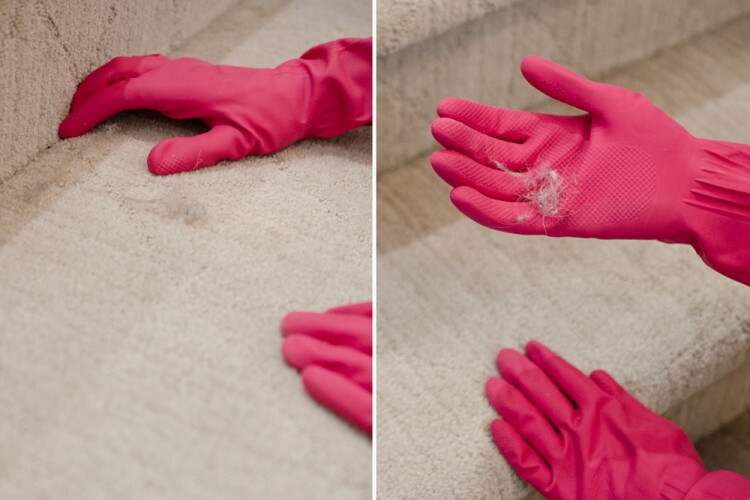 Wear rubber gloves to pick up what the vacuum doesn’t.